James Trussart is one of the few builders who has broken the mold of traditional guitar making. Working with steel as the primary material, he produces guitars that are as unique in appearance as they are in tone. Trussart is a musician-turned-luthier. The Parisian native began his career as a fiddler, accompanying Cajun singer-songwriter Zachary Richard in the late 70s, before turning his attention to crafting violins and later guitars in 1980. From his current So-Cal home workshop (where he’s resided since 2000), Trussart crafts custom steel-bodied guitars, basses and violins in a dazzling array of finishes, reminiscent of shiny chrome resonator instruments and rusty, weathered or fossilized discarded machinery. “I’ve always like the look and feel of old guitars, believing them to have a life beyond that of their creator,” says Trussart. “And I wanted to somehow emulate that effect of age and history on my own guitars. I wanted to make a guitar that came with a history and a slight element of neglect, of decay, so it had a personality of its own. Trussart’s creations are designed to have the look and feel of a vintage instrument with the added appeal of a metal construction. His “Rust-o-matic” technique involves leaving the guitar body exposed to the elements for several weeks, allowing it to corrode before treating it to stop the corrosion. He then sands it to replicate years of distress, and then finishes it with a clear satin coat. Many of the Trussart models features patterns either engraved or literally imprinted into the metal bodies or on the pickguard or headstock. Engraved skulls, roses and tribal art are some of the more common themes, while others feature textures of alligator skin or plant materials. He literally sandwiches the metal with the alligator skin and lets it sit in water for several days. Various pickup options are offered like TV Jones, Arcane-inc, & Seymour Duncan. Neck options offered are the classic radius and shape guaranteed to fit the most demanding players needs. Rebel Guitars is an authorized dealer of James Trussart Guitars. 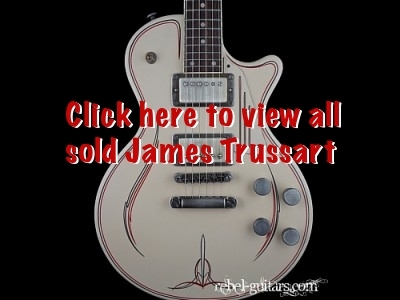 View the James Trussart Guitars we’ve sold.